Another try. This is the third attempt by Lenovo to make the affordable 13 inch ThinkPad Edge into a blockbuster in the entry level business segment. A slightly reworked case and improved stability are supposed to make the difference this time around. The question is whether it will be third time lucky? 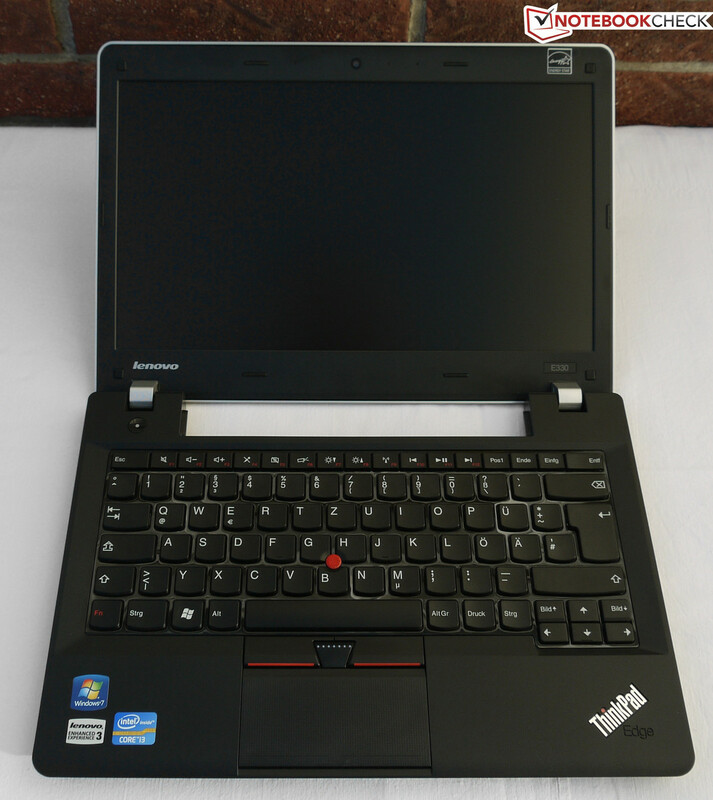 When hearing ThinkPad, most people will still think of the robust but somewhat conservative notebooks from the T, W and X Series. 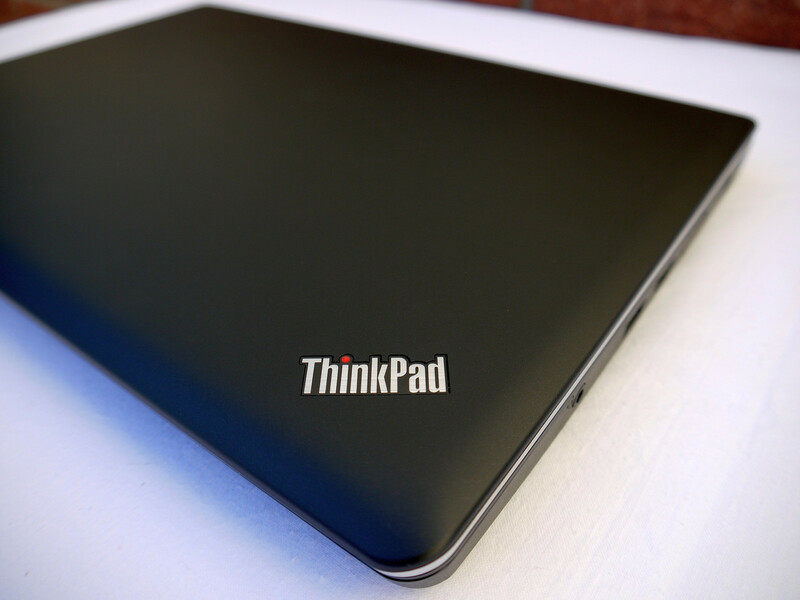 The fact that there are also more modern versions has been proven by Lenovo since quite some time with the ThinkPad Edge Series, which is available with display sizes ranging from 11.6- to 15.6-inches. 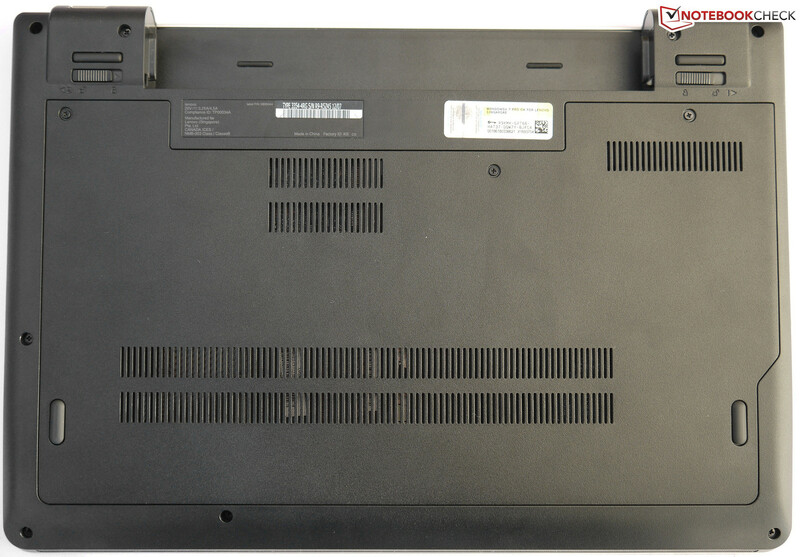 We have already reviewed the 11.6-inch (Lenovo ThinkPad Edge E130/E135), 14-inch (S430) and 15.6-inch (E530/E535) versions, and have repeatedly determined a good manufacturing quality and long battery runtimes. The last remaining device in the generation is now the E330 with a diagonal display length of 13.3-inches. 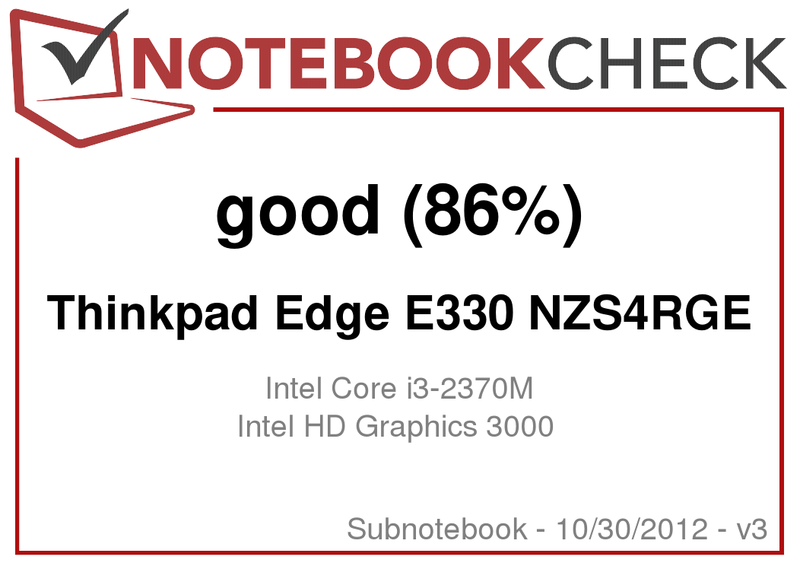 It is now just over a year ago since we reviewed the 13.3-inch ThinkPad Edge E320, time which Lenovo has put to use in order to rework the device. Whether the previous weaknesses have been ironed out with the new model, and to what extent the cosmetic changes compare to the predecessor models, will be revealed by our comprehensive review. With just about 1.8 kg the E330 may not belong among the lightweights in the 13-inch segment, but in this case the battery accounts for 18% of the total weight. The display lid surface is covered with a black soft-touch material which is supposed to protect it from getting scratched. For those that find the midnight black to be a bit too much on the conservative side, there are also the colors red (heatwave red) or blue (Arctic blue) available to choose from. 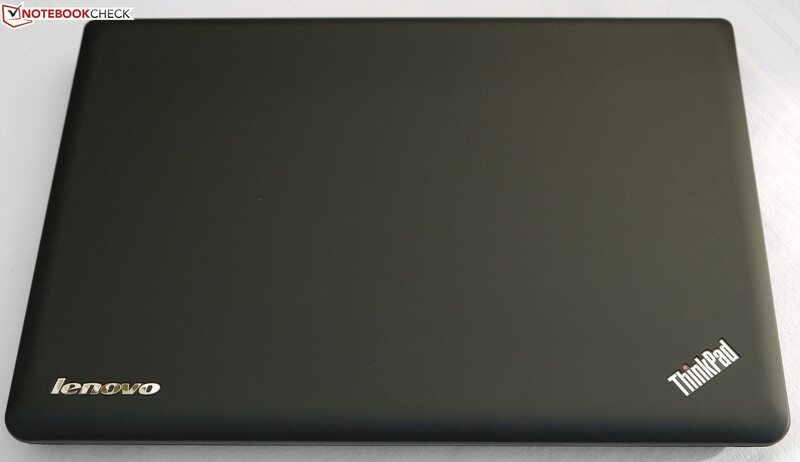 Regardless of the color of the display lid, the remainder of the notebook is made of a black plastic material. The surfaces are primarily kept matte, with the only exception being the keyboard, which is glossy - as with the predecessor. While the slightly changed design still allows for divided feelings, the manufacturing quality should nevertheless be good enough to convince all the critics. With pressure applied to various areas we weren't able to induce any considerable indentations, and the rigidity of the case also doesn't allow any cause for criticism. Opening the display is only possible with two hands due to the stiff hinges. The silver hinges make a metallic impression, but closer inspection reveals that they are in fact composed of a plastic material. Nevertheless, they hold the display firmly in place and only allow it to teeter to a limited extent. One negative aspect is the battery, which is not sufficiently well fastened by the battery latch, and therefore wobbles back and forth in its slot a little bit. On top of this the display lid doesn't fit flush with the case everywhere. 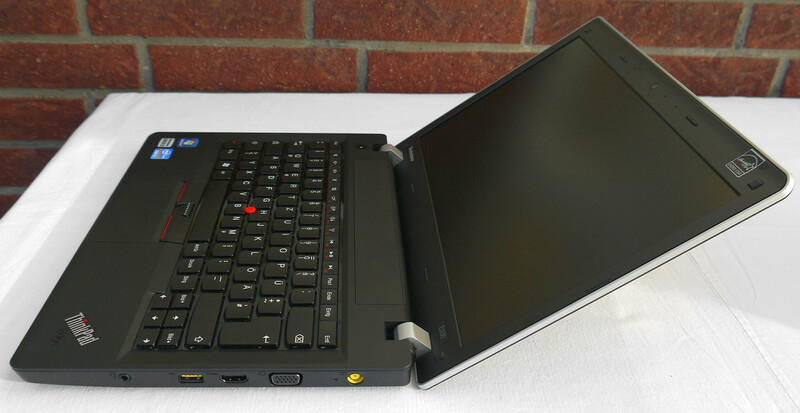 This was probably not planned this way by Lenovo, since the shape has been adopted from the clamshell design used by the more expensive ThinkPad series which is supposed to prevent the entry of dust and other dirt. 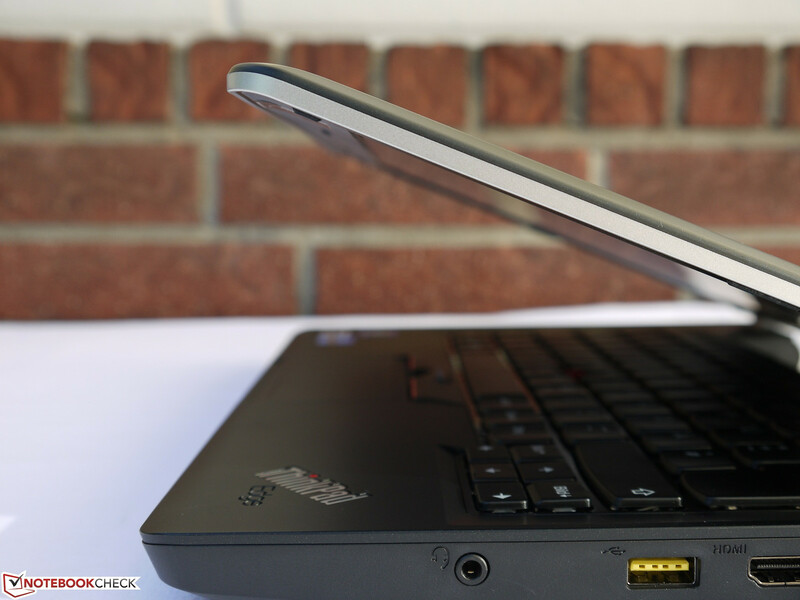 Altogether the 13-inch notebook still leaves a very positive and well balanced impression. As with the predecessor model, most of the interfaces have been distributed along the sides, so that the front only houses the speaker mesh, and the back is only occupied by the battery and the hinges. The selection of interfaces has also been modernized and changed. Lenovo has now forgone the eSATA port, and has instead included two equally fast USB 3.0 ports which now leads to a total of three USB ports overall. A further change has been made to the VGA port, which is now located between the HDMI port and the power input. 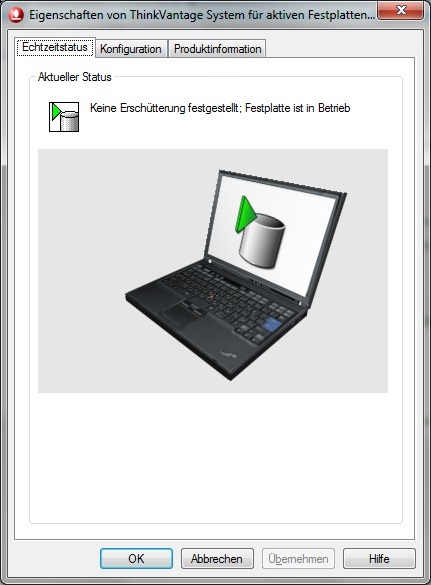 This allows for a tidy desktop with a multi-monitor configuration, although putting this on the left side of the device would have been more comfortable for right handed users using a separate mouse. Interfaces at the back of the device would have represented the ideal scenario. For wireless communications Lenovo has adopted Intel's Centrino Wireless-N 2230 module. The plug-in card supports the WLAN standards a/b/g/n, as well as communications with other devices via the current Bluetooth 4.0 standard or Wi-Fi Direct. On top of this, compatible televisions and monitors can be wirelessly driven via the "Intel Wireless Display" technology. A further possibility for connecting to a network is provided by the Gigabit Ethernet port, the chip for which is provided by Realtek. 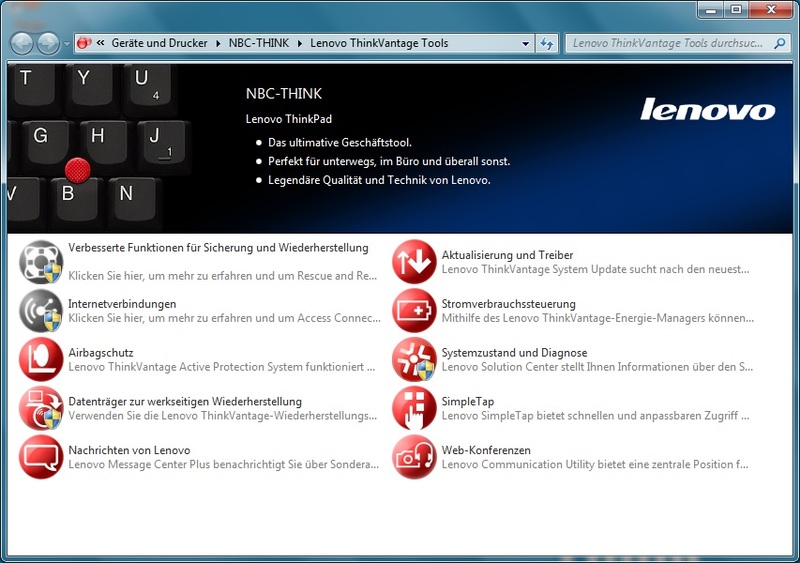 With the ThinkVantage Tools installed Lenovo provides a comprehensive and useful package of software. 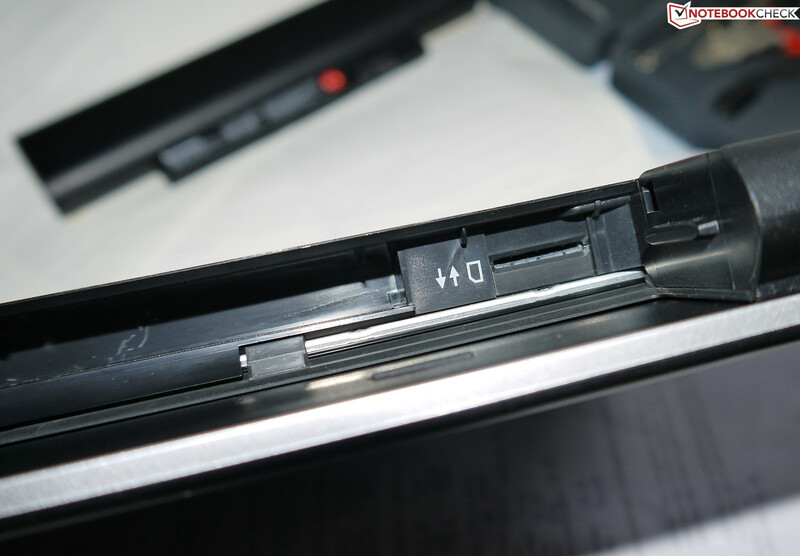 For example, data security is provided by Lenovo's Airbag Protection, which quickly switches off the hard drive if a sudden movement or dropping of the notebook is detected. The accessories included with the delivery can be summed up quickly since these merely include the battery, AC adapter and a quick start guide with directions to the electronic manuals. Releasing the three screws on the bottom of the device provides access to the RAM, hard drive, WLAN card, CMOS battery and even the cooling fan, for upgrading or cleaning. In addition to this, users also have a free port available, which is suitable for mSATA as well as miniPCIe cards, and therefore can be fitted with a cache SSD or WWAN card. 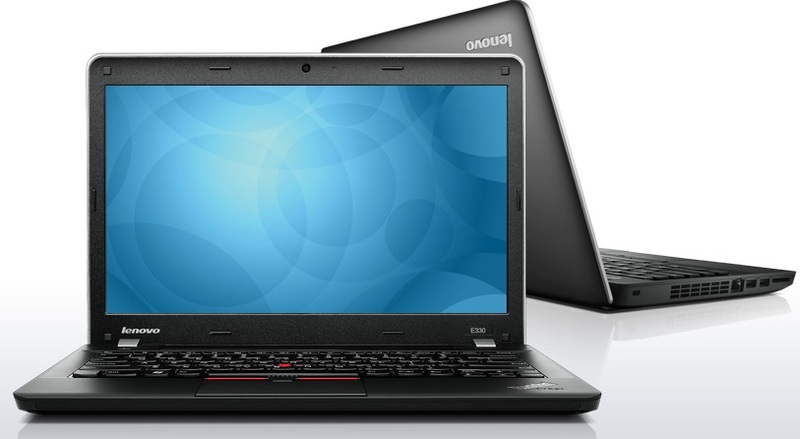 As standard Lenovo provides a 12 month send-in warranty. 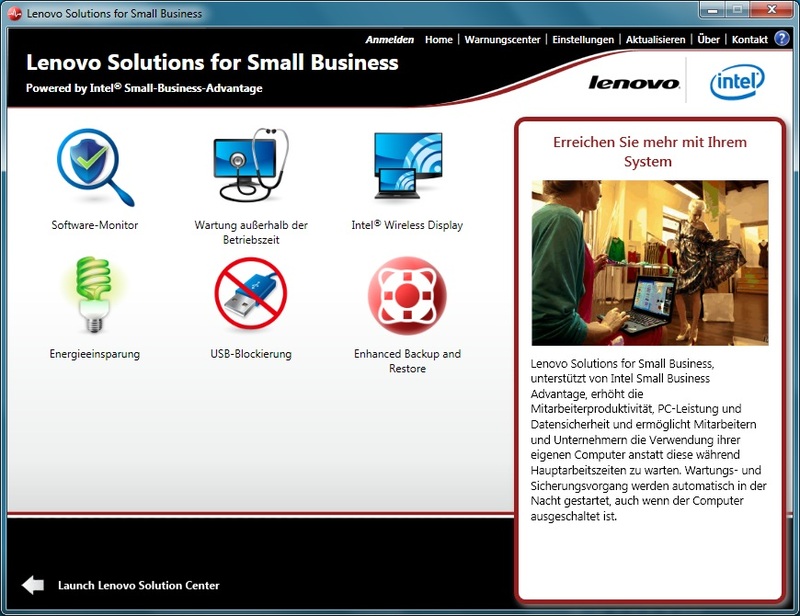 In addition to this, Lenovo also offers optional extension packages in its online shop. The most affordable among these is Lenovo's ThinkPlus 2 year bring-in, which will set buyers back by a single 44 Euros (~$56) payment. 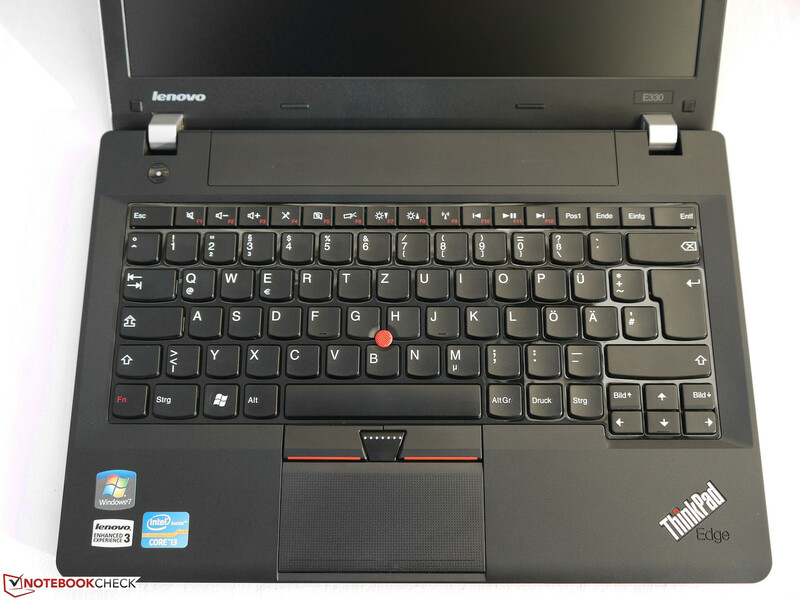 When it comes to the keyboard, Lenovo has opted for the tried and tested AccuType keyboard with a key size of 16 x 16 mm. The arrow keys have also grown and provide more comfort as a result. In addition to this, the keys provide a crisp pressure point with a well defined key travel, while also having a pleasant end stop sound. The upper row of keys is occupied by the special functions as standard. The F keys on the other hand are available in combination with the Fn key. Pressing the Fn key several times in a row elicits a popup message, which allows the behavior to be reversed. The only negative aspect of the keyboard is the swapped locations for the Fn and Ctrl keys, which makes copy & paste operations a bit confusing in the beginning. 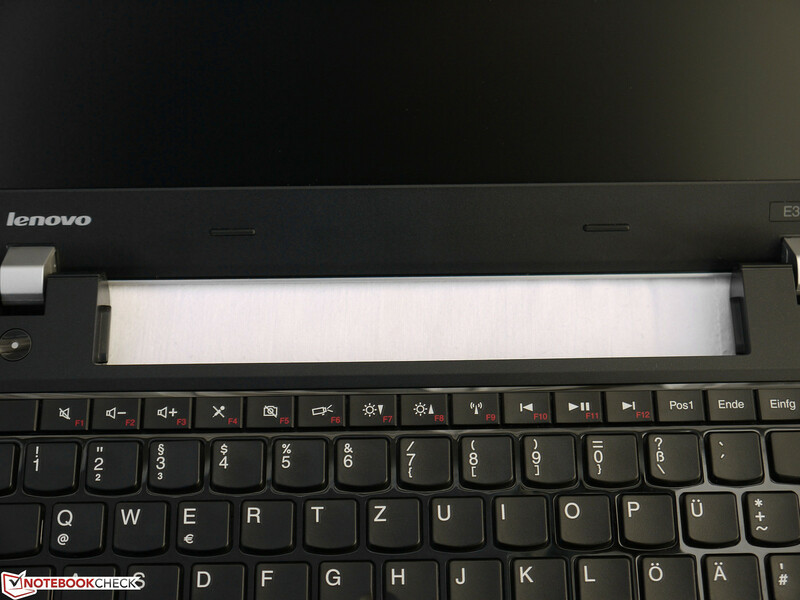 With the current ThinkPad models it is entirely up to users how they want to move the mouse cursor across the display, whereby a choice has to be struck between the TrackPoint integrated into the keyboard or the Synaptics ClickPad. 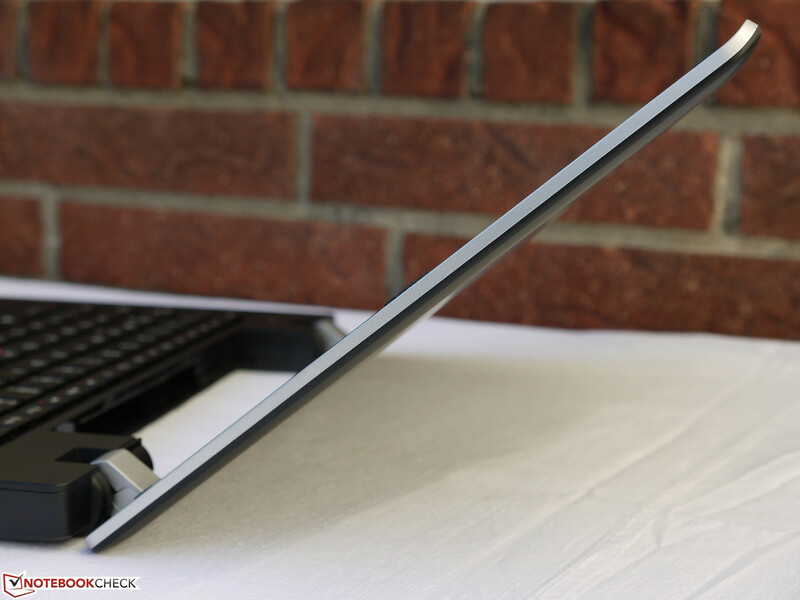 The ClickPad has dimensions of 92 x 42 mm, and has a slightly structured surface to improve its gliding properties. 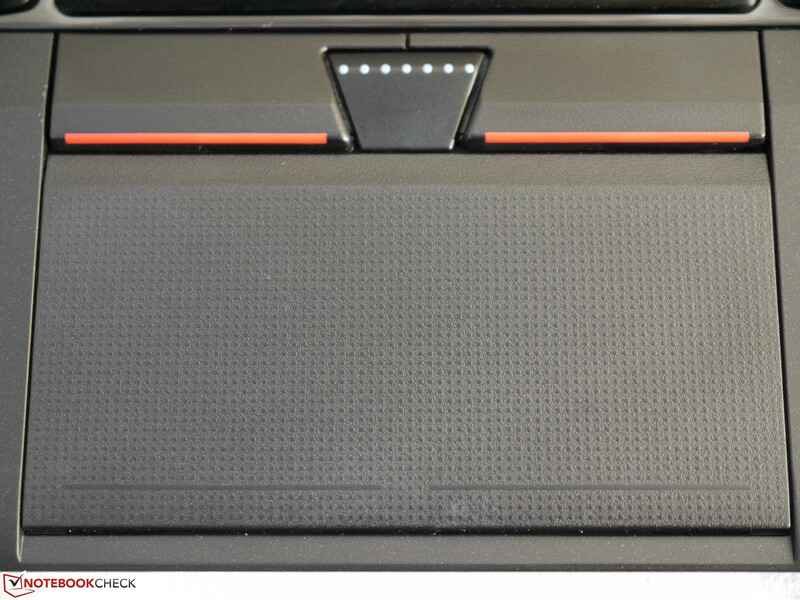 The buttons for the ClickPad are integrated into the touch surface and require more pressure than the conventional mouse buttons in notebooks. 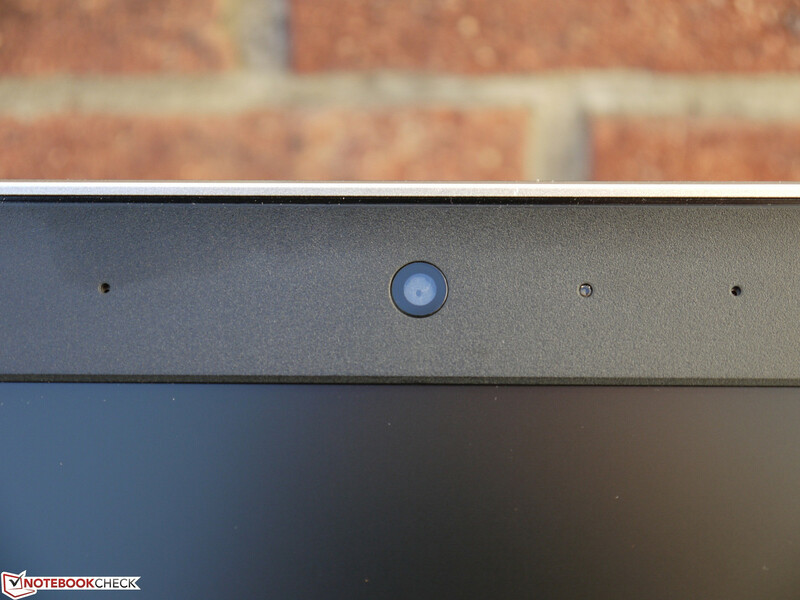 On top of this, the height to width ratio of the touchpad could also require a bit of getting used to. 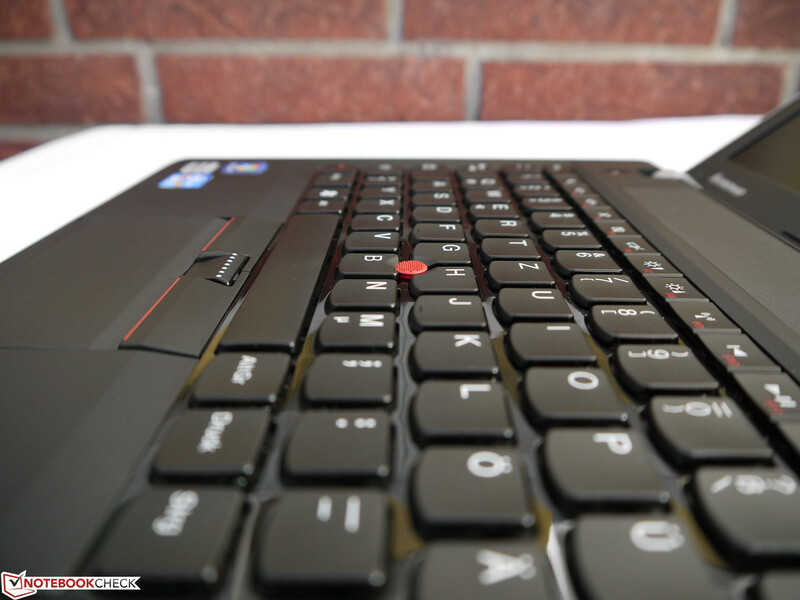 The TrackPoint on the other hand leaves a fabulous impression. The three accompanying buttons beneath the space bar are quiet and have a pleasant pressure point. In this case: once you get used to the red knob you are likely to quickly learn to appreciate it and probably refrain from using the ClickPad. The non-reflective Samsung panel (type LTN133AT20) provides a WXGA (1366x768 pixels) resolution over the 13.3-inch display with an aspect ratio 16:9. 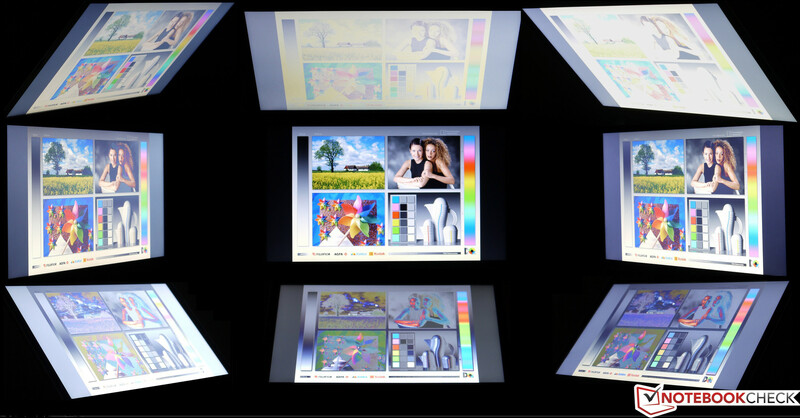 The panel is based on the TN technology and uses white LEDs for its backlight. 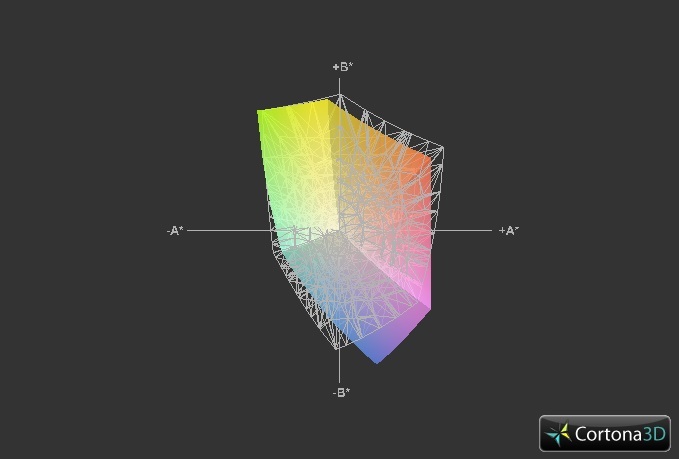 The illumination of the display of 95% proves itself to be very good, and doesn't allow for a brightness variation to be visible between different areas of the screen, even with uni-colored display content. The black level is a bit of a disappointment though at 1.79 cd/m², which leads to the meager contrast ratio of 127:1. The predecessor was able to present a marginally better contrast ratio with 189:1. Meanwhile, the average picture brightness reaches a maximum of up to 222 cd/m², which amounts to an improvement of 28%, and thus ranks it among the mid-range. In addition, the display content is now also not dimmed during battery powered use, which allows for the full display brightness to be available without the power cable attached. 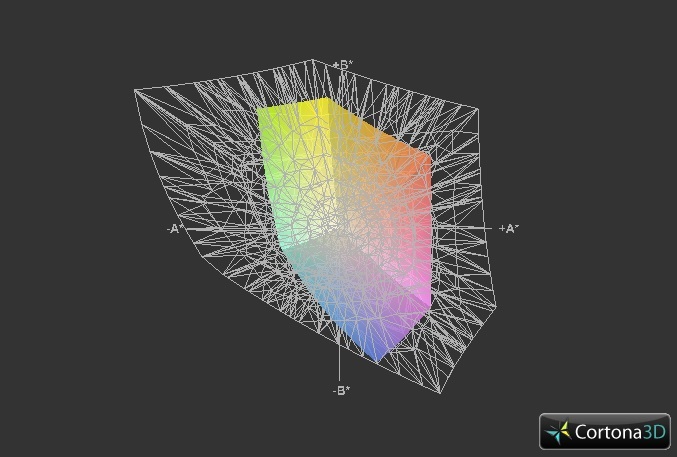 The sRGB and Adobe RGB color spaces are not covered as usual for this price segment. 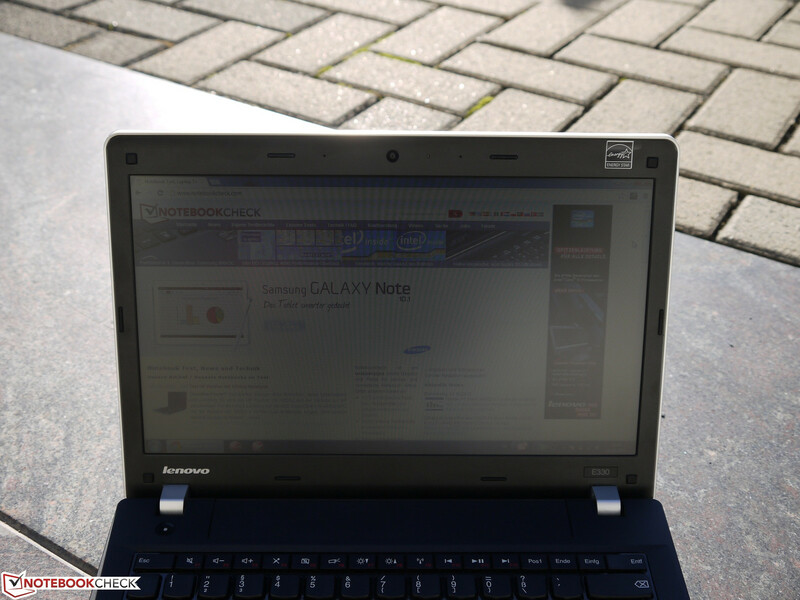 The notebook is clearly not suited for professional image editing, due to the low contrast and small display size. Indoors and in the shade the available display brightness allows for unfettered working. Working under direct sunlight will likely lead to the conclusion that the brightness is not sufficient though. With the constricting viewing angles another characteristic feature of the TN technology becomes apparent. When moving horizontally by 45 degrees the colors may become slightly discolored, but the content still remains clearly visible. Changing the vantage point vertically leads to a noticeable change of the colors. Since a 13.3-inch notebook is nonetheless conceived for a single person, looking at the display from anywhere else than the center will probably be an unlikely scenario. Those that could take a liking to the small companion in terms of the case, input devices and the display, will now have to decide how much performance it should provide. 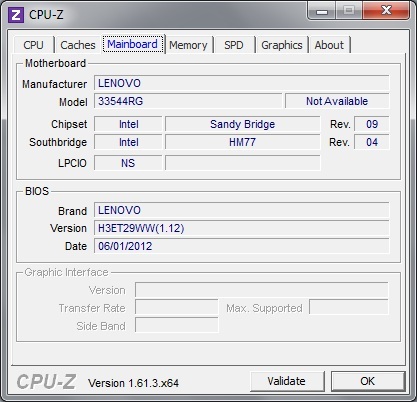 Available to choose from are processors from the Sandy Bridge and Ivy Bridge generations. There is the Intel Pentium B970, the Core i3-2370M (in the reviewed notebook) and the top performance model Intel Core i5-3210M. 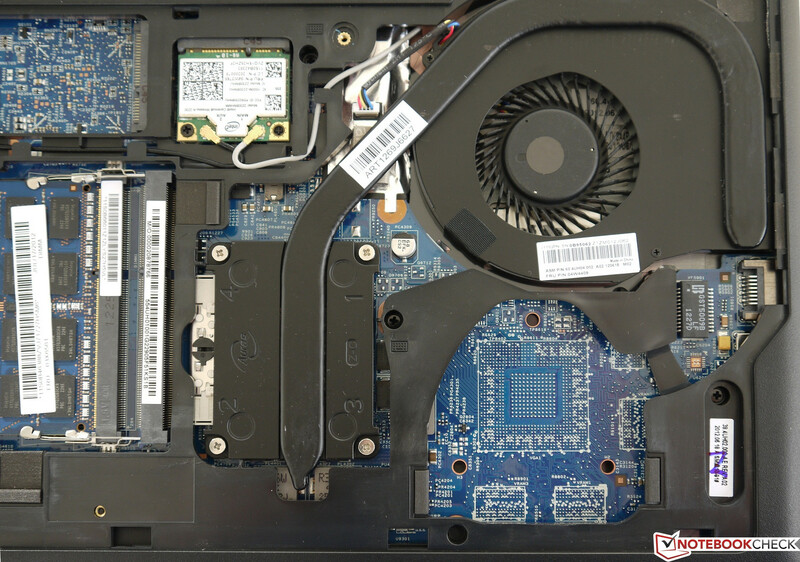 Alternatively it would also be possible to opt for the ThinkPad Edge E335 sister model, which is equipped with an AMD processor. In cases when the Intel platform is chosen, it is also possible to order the entry level NVIDIA GeForce 610M additionally. Compared to the Intel HD Graphics 4000 in the Core i5-3210M this doesn't provide a significant performance enhancement though. 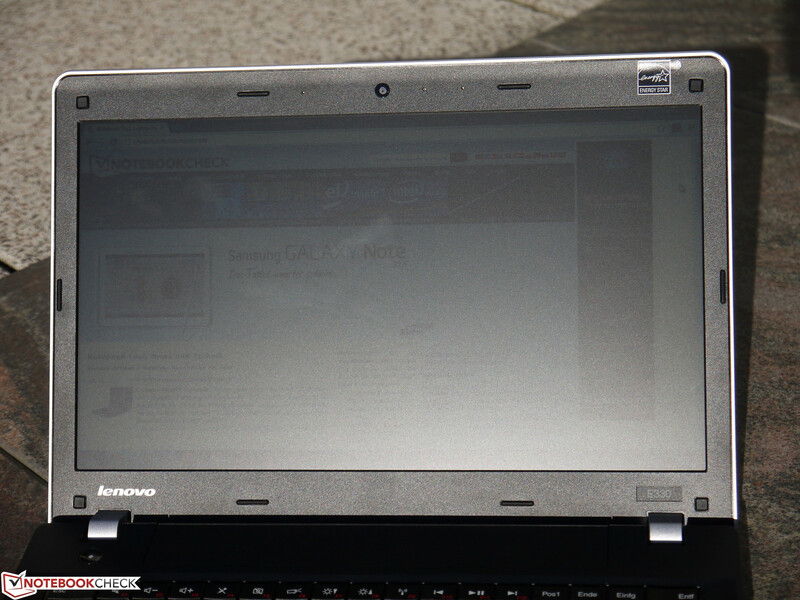 The considerably more potent GeForce GT 630M touted on the Lenovo homepage is unfortunately not available yet. For office use, watching HD movies, or surfing the web, the smallest processor variant in the form of the Pentium B970 should be more than enough. For more complex applications, such as CAD or graphics programs, it would be worthwhile upgrading to the i3 or i5. Our test configuration contains Intel's dual-core Core i3-2370M processor, which is able to simulate a third and fourth core thanks to Hyper-threading, and thus process 4 threads simultaneously. A Turbo Boost on the other hand is only available with i5 and i7 CPUs. During the Cinebench benchmark the CPU performance is on the expected level and ties in with similarly good results from other notebooks with the same CPU configuration. Compared to the ThinkPad Edge E320 (with Core i3-2310M) the rendering performance in Cinebench R11.5 64-bit multi-core was improved by 13%. 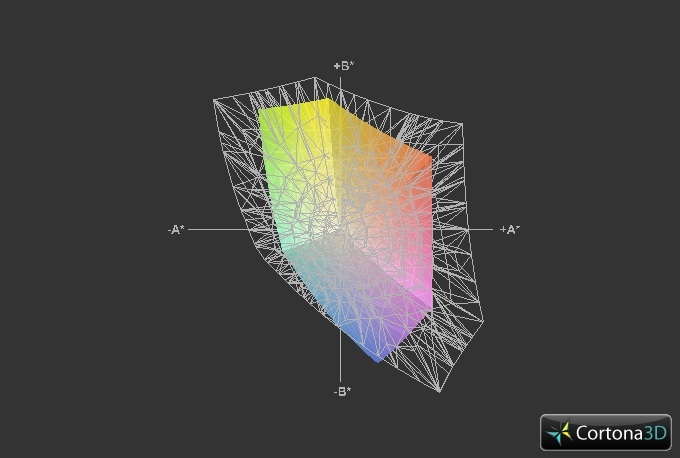 In the OpenGL test the new model is able to further improve this to 17%. 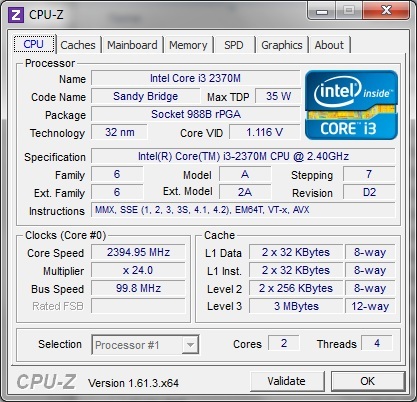 In case of deciding for the Ivy Bridge processor i5-3210M, then another performance increase of between 25% and 38% (multi-core and OpenGL tests respectively) can be expected. On the other hand, the Intel Pentium B970 processor would diminish the performance by 23% and 24%. The competitor model HP ProBook 6465b (AMD) is only able to outperform the reviewed device by 37% in the OpenGL test, while it is 13% slower in the multi-core test. The result of the Cinebench benchmark was identical with the power connected and when battery powered, thus the maximum performance can also be utilized during mobile use. The PCMark 7 benchmark ascribes a good score of 2079 points, and proves to have a slight advantage compared to its predecessor model (2009 points). Reasons for the good results are the potent CPU and the fast hard drive. This makes itself noticeable in the perceived speed, whereby only short waiting times are apparent when opening Word, a browser, or a video player. Upgrading to an SSD would significantly increase the speed of the system. 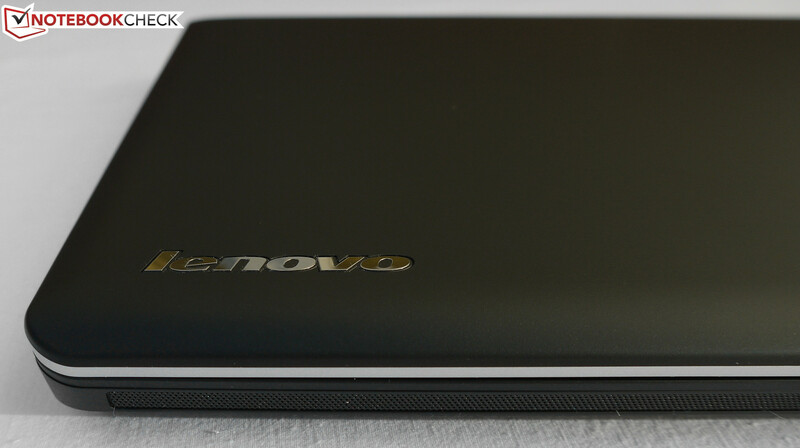 When it comes to the hard drive Lenovo has opted for the Seagate Momentus Thin (ST320LT007-9ZV142) with a total capacity of 320 GB for our reviewed device. The net capacity available to users after the first boot lies at 255 GB. 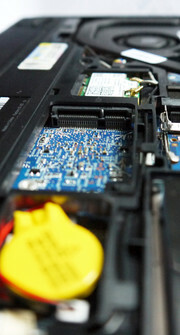 Connectivity of the HDD is established via SATA II, although the notebook is also SATA III capable. 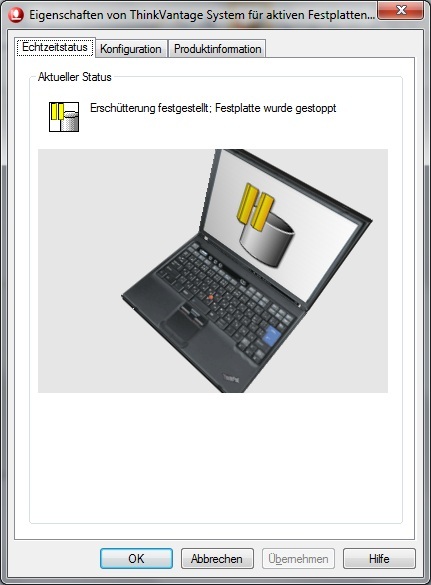 The adopted hard drive may only have a case height of 7 mm, but hard drives or solid state drives with a height of 9.5 mm would also have enough space to fit according to the official Lenovo E330 specifications page. The manual, however, claims only 7 mm drives are accepted, so larger 9.5 mm drives can be either hit or miss. 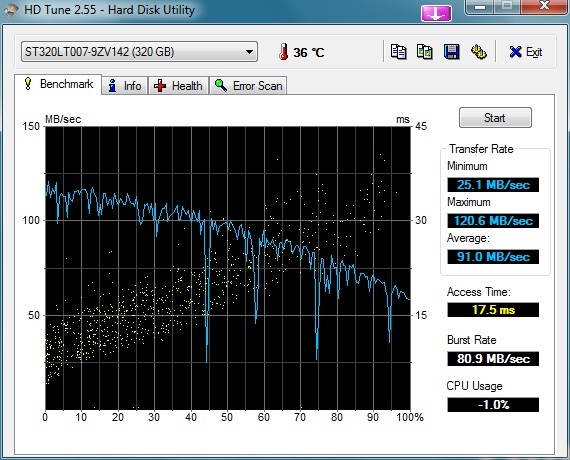 Despite the high rotational speed of 7200 rpm, the HDD stays quiet consistently and never becomes annoying. On top of this it is also able to make a good impression thanks to high data transfer speeds and short access times. Our reviewed device contains the Intel HD Graphics 3000 integrated into the CPU as a graphics unit. 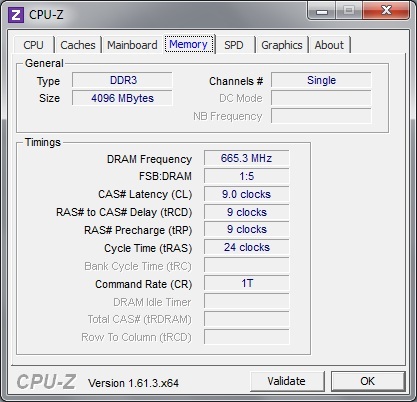 The GPU has a clock speed of 1150 MHz in Turbo Mode, while the standard clock speed was determined to be 650 MHz. The HD 3000 doesn't have its own graphics memory and therefore has to access the system RAM. 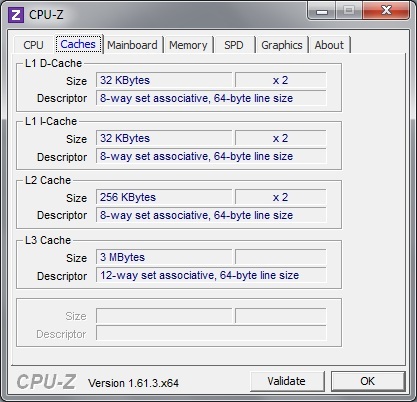 The GPU, which first appeared in February of 2011, only supports up to DirectX 10.1 API. In 3DMark Vantage the GPU in the E330 scores 1315 points, and is marginally better than the Radeon HD 6520G (1254 points). 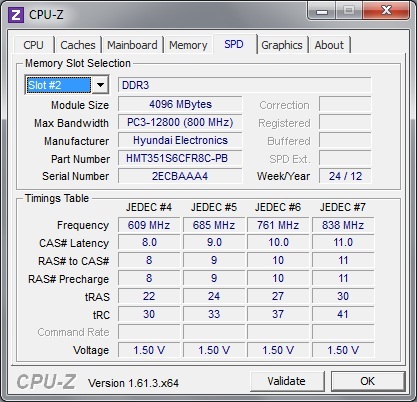 The Intel HD Graphics 4000 from the Ivy Bridge processor i5-3210M meanwhile achieves a 78% better score in the same test. The GeForce 610M from Nvidia only manages an additional 19% improved performance. As with the CPU, the graphics card shows no throttling during battery powered use. Games and the 3DMark benchmark results therefore remain identical. The HD Graphics 3000 is doubtlessly overwhelmed by up to date games, which is why they can only be played reasonably well with a low resolution (1024x768) and the lowest detail settings. The only exception to this is the not especially graphically elaborate FIFA 13, which can also be played smoothly with medium details using the native resolution (1366x768). In addition to this, the quality settings for older games from before 2009 can usually be set to higher options without problems. Further information regarding the gaming suitability with this graphics unit can be found in our main article Gaming Performance of contemporary Graphics Cards. In an idle state the E330 remains inconspicuous throughout and the hard drive stays pleasantly quiet. Surfing the internet and using office applications should therefore only rarely activate the cooling fan. In case the cooling system is provoked by maximum utilization of the CPU and GPU components, then the system noise increases to a clearly audible 36 dB(A). However, this will only become annoying after several hours or in very quiet surroundings. During the 3DMark 06 benchmark we measured a quiet 33.5 dB(A). The surface temperatures on the E330 are almost exemplary and are able to make a convincing impression throughout. With a maximum of 32 °C the palm resting area remains pleasantly cool in every one of our test scenarios. Meanwhile, the temperatures on the bottom of the notebook also don't exceed pleasant limits during extreme utilization (100% CPU and GPU load). Use of the notebook on a lap is therefore not limited to any extent. The notebook also manages to do well during the stress test (Furmark + Prime 95). There was no throttling observed, even after three hours of full utilization of the systems CPU and GPU. The maximum temperature reached was 81 °C (CPU) and 74 °C (GPU). A following 3DMark 06 benchmark also ended with the same result as one performed in a "cold" state. (+) The maximum temperature on the upper side is 36.1 °C / 97 F, compared to the average of 35.8 °C / 96 F, ranging from 22 to 57 °C for the class Subnotebook. (-) The average temperature of the palmrest area of similar devices was 28.6 °C / 83.5 F (-3.9 °C / -7 F). 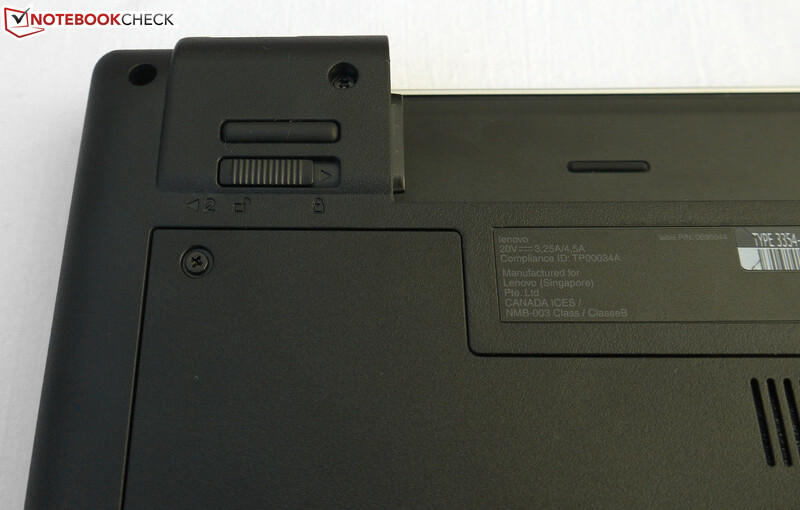 The two speakers at the front of the notebook are able to score thanks to a high maximum volume. In addition to this, the audio doesn't distort when the volume is set to its limit. On the other hand, the bass is almost entirely neglected, and also the high frequencies are not particularly distinctive. 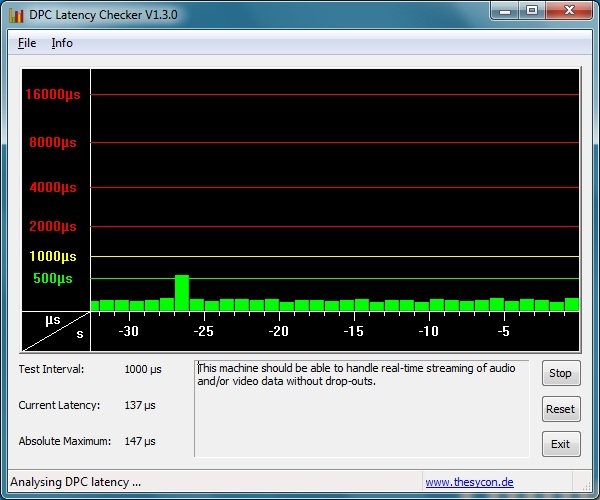 In this case, the equalizer settings in the Dolby Advanced Audio v2 software can't make a meaningful improvement either. For a better audio experience there is always the possibility of using external speakers though, which can be connected to the 3.5 mm mini-jack socket, or the digital HDMI port. 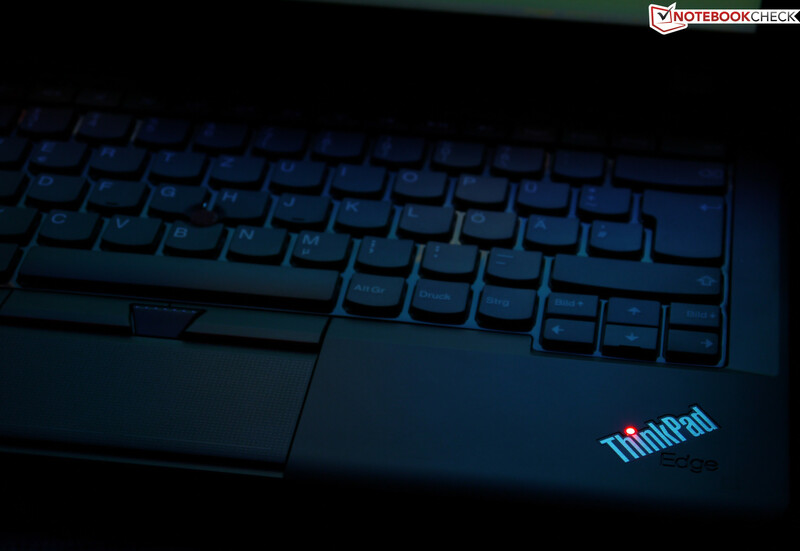 The power consumption of the ThinkPad Edge E330 almost reaches Ultrabook levels with a minimum of 6.3 and maximum of 10.1 watts. 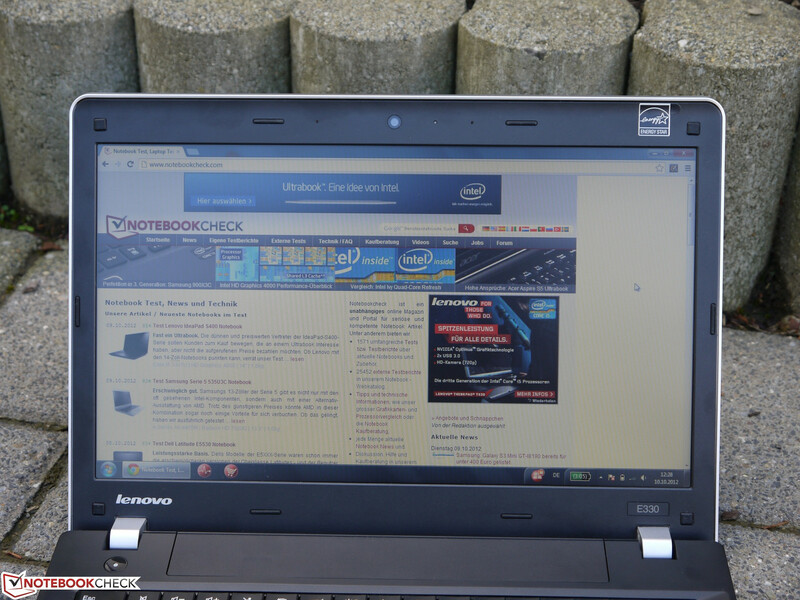 In this case, Lenovo has once again managed to make an immense improvement compared to the predecessor (8.8 - 13 watts). 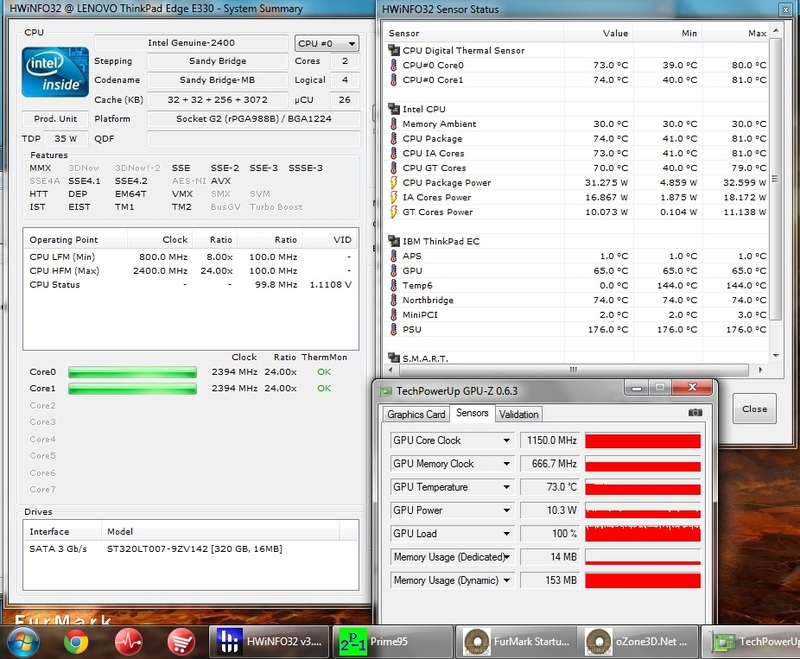 In 3DMark 06 the power consumption rises to a not quite as astonishing 37.4 watts. The maximum required by the E330 is 49.8 watts with 100% CPU and GPU utilization as well as maximum display brightness. It therefore requires more power throughout when utilized compared to the E320, which also leads to a shorter battery life. 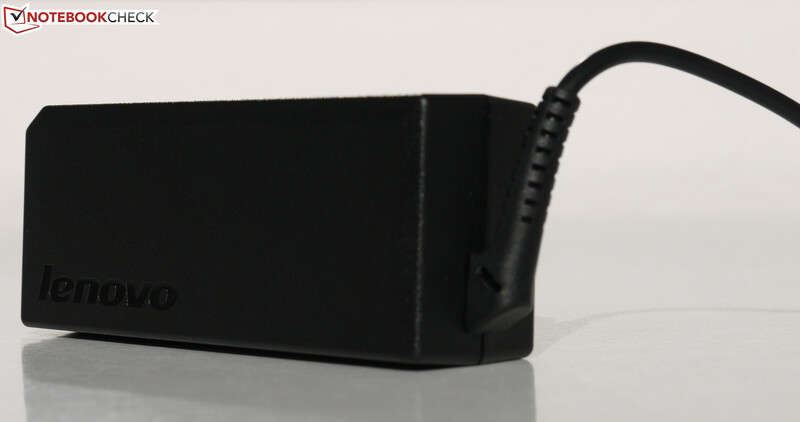 The 65 watt AC adapter is sufficiently dimensioned, and even during maximum utilization the battery can still be charged. The manufacturer of the subnotebook promises a battery life of up to eight hours with the 63 Wh battery. We even measured 9 hours and 48 minutes in our unrealistic test (minimal brightness, wireless modules off, Battery Eater Reader's Test), and therefore an hour more than with the ThinkPad Edge E320. 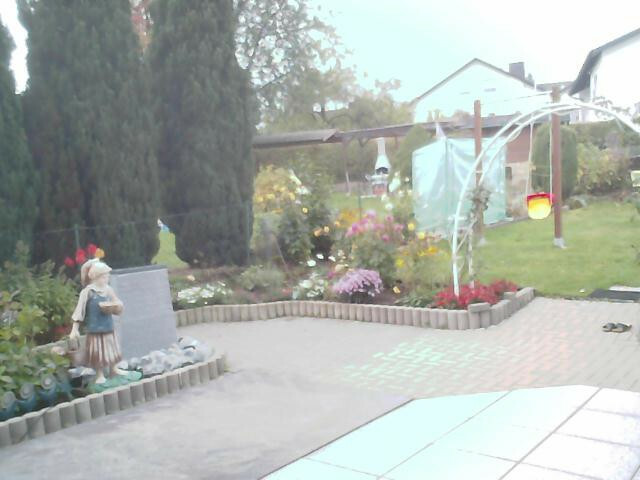 When it comes to a more realistic scenario, such as with the brightness set to 150 cd/m² while loading different websites, then the device manages to last for 5 hours and 45 minutes. Not a bad value; even though its predecessor - with similarly potent components - lasted for more than an hour longer. While utilized with the Battery Eater Classic Test we measured a runtime of 1 hour and 53 minutes, also less than with the ThinkPad Edge E320 (2 hours and 17 minutes). 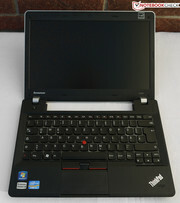 Compared to its peers the ThinkPad Edge E330 ranks among the upper mid-range. 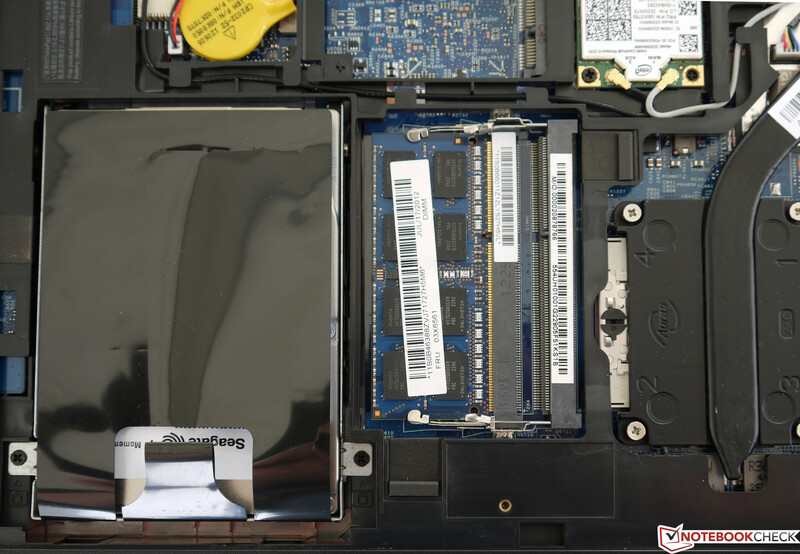 Subnotebooks with better battery runtimes usually only have a processor with a TDP not exceeding 25 watts, and also generally have less processing power. 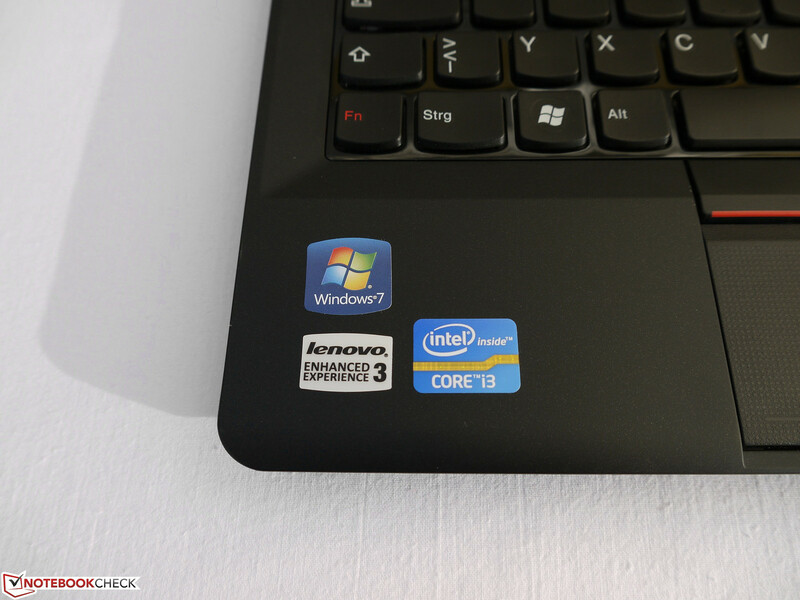 Third time lucky really does seem to be the case and Lenovo has managed to create a solid package this time around. The manufacturer seems to have listened to its customers and has ironed out the shortcomings from previous models. Among these is the case stability, which is now once again up to the expected ThinkPad standard. Furthermore the display no longer dims when battery powered and also has a higher maximum brightness. In the case of the system noise Lenovo has also introduced some improvements, and the cooling fan now generates a maximum of 36 dB(A) (stress test). The only point of criticism compared to its predecessor is the shorter battery life when utilized. 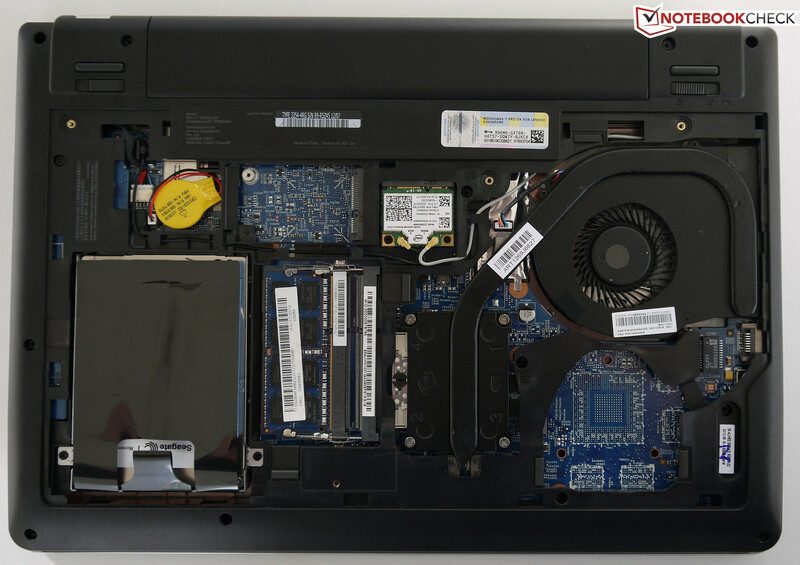 Compared to the competitor models Dell Vostro 3360 and the HP ProBook 6465b, it is nevertheless still able to impress, although these have an advantage when it comes to the manufacturing quality. 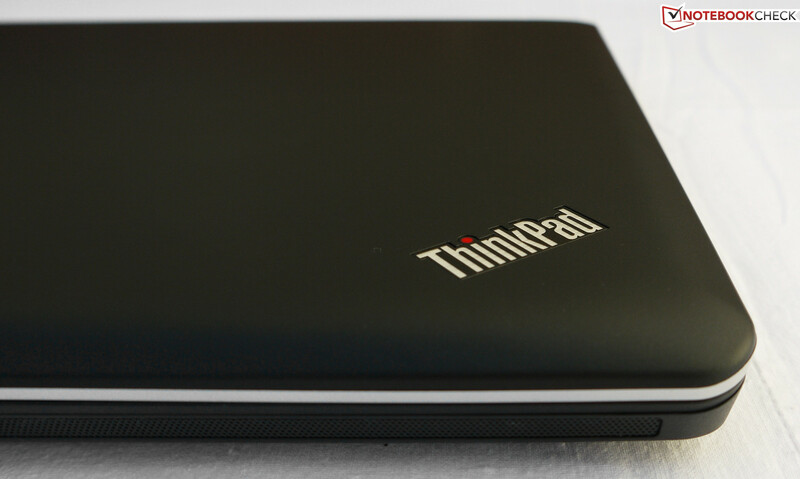 Those that spend a great deal of time writing on a notebook should consider the ThinkPad due to its good keyboard. The E330 also has the advantage of being well suited for daily transportation with its compact dimensions, low weight and solid case. It could be ideally suited to students and others who require more processing power than that provided by a netbook. Those that could also come to terms with less performance might possibly find a suitable alternative in the Edge E335 which is 100 Euros (~$128) cheaper. ...and the weight sinks to 1474 grams. 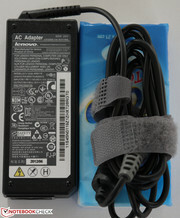 The notebook is charged via an included AC adapter. This is very compact and weighs 345 grams. The operational status is indicated by an LED on the display lid and palm resting area. The maintenance panel is secured by 3 screws. ...and the WLAN card and cooling fan. Thus the fan can easily be cleaned. In addition, there is still an mSATA/miniPCIe slot available. With which it is possible to attach a WWAN module for example. ...which still has a ThinkPad label? ...and comes with the tried and tested input devices. The hinges are also composed of plastic. The display lid doesn't lie completely flush. The overall impression is nevertheless still good. Fn and Ctrl keys are swapped around. The maximum opening angle is sufficient for use on your lap. ...and is too light sensitive. 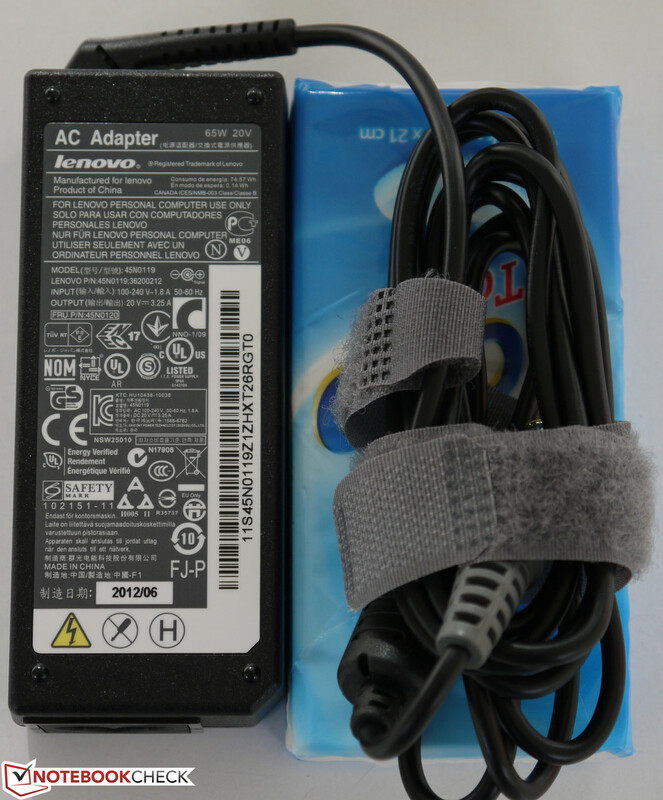 Using the yellow USB port, devices can still be charged while the notebook is switched off. ...and attaches flush with the device. 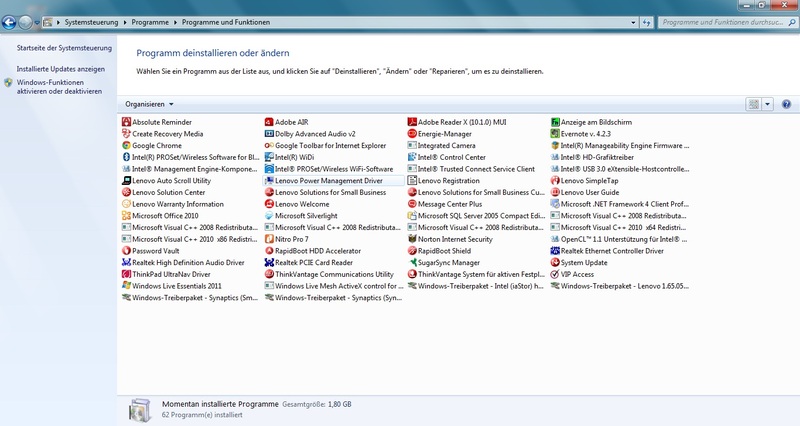 Especially useful among these are the ThinkVantage Tools. 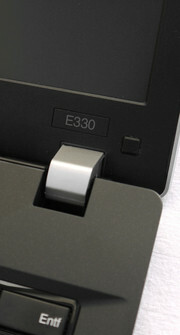 Despite the low price the E330 is able to impress with its solid build quality and exceptional input devices. A keyboard backlight (or a ThinkLight) would improve working in dark surroundings. At first glance there isn't much of a difference between the E320 and the E330, but taking a closer look quickly reveals that there have been a few changes. Acer TravelMate P243, Dell Vostro 3360, HP ProBook 6465b, ASUS P43SJ, HP ProBook 4340s, or the Lenovo ThinkPad L420.